I must preface this post with a happy disclaimer: I love library customers. I love helping them. I love giving them a good feeling about the library. I value great customer service and I love to provide it. At least 90% of our customers are polite and appreciative. Perhaps another 5% are developmentally or socially disabled, and may or may not be conventionally polite. No problem. The other five percent is not a big deal. Another preface: I am always very patient and polite. Some of you know about an incident when I lost my temper with a customer - with good reason! a dangerously neglected baby! - but I used that experience as a learning opportunity, and I've never come close to doing that again. I've perfected the facial expression and body language that doesn't agree but doesn't challenge: the tight semi-smile, the slight shrug, the noncommittal head-tilt, the raised eyebrows. A kind of "whatever you say, you won't get a rise out of me" kind of face. So when I tell you these are my least favourite customers, you can be sure of two things: one, they are a very minor part of my job, and two, I keep my feelings well hidden. But I do need to vent! Unbeliever: I'm here to pick up a recreation pass for my father. L: I'm afraid we don't have recreation passes here. What kind of pass is it, maybe I can help you find the correct place to get it. Un: No, it is here. The email said I can pick it up at any community centre. L: I see. This is not a community centre. There is the Recreation & Parks department across the way, but they close at 4:30. [It is now 8:45, 15 minutes before closing.] Can I get the name of the pass so I can check for you? Un: No! It said any community centre! It said I could pick one up here! Un: I am here to pick up a pass! Just give me the pass! Un: This! [Pointing frantically at a printed-out email.] This! This! Un: Right here! [Frantically stabbing the screen with his finger.] Right here, it says I can come here! Right here! L: That's the Burnhamthorpe Recreation Centre. That's on Burnhamthorpe near Dixie. Un: No, not that, not that! Scroll down! Scroll down! L: These are all the community centres in Mississauga. It looks like you can pick up that pass at any of those, or at the Recreation and Parks department across the way [I show him where that is], but they do close at 4:30. I saw a Ranter just this morning, moments after we opened for the day. L: Good morning, how may I help you? Ranter: I don't have a question, just a general comment. Did you see the article in the paper about the decline of math scores? Ranter: What do you think of that? What do you make of a society that doesn't teach kids the basics? I mean, we have 9, 10, 11 year old kids using calculators, punching buttons! That doesn't teach you anything! No one learns the basics anymore! L: [slightest shrug] I've been seeing stories about declining test scores all my life. I don't put too much stock in it. R: Right, right. Around here, we have all the Asian families, they send their kids to Kumon, where they drill, drill, drill, and they get the high math scores. R: Do you see the names of the kids who win the math and science prizes? They're all Asian. You don't see one Canadian kid on that list. L: [slight smile] Those children are Canadian, too. R: Yes, of course, of course they are Canadian. But you get my point, right? You know what I'm saying? L: [tight lipped, nod] I believe I do. Ranter is not always racist. But Ranter comes to the desk only to rant, to announce, to declaim. Should I feel sorry for him because he has no one who will listen and he must resort to Ranting to strangers? Maybe, maybe not. But really, all I think at the time is, Why are you telling me this???? Do you ever borrow ebooks from your public library? Do you have any idea how your library adds ebooks to its collection, or at what cost? The number of library customers who borrow ebooks is growing all the time. How many of them, I wonder, are aware of how their library gets screwed every time they do. Even some library staff is unaware of the raw deal libraries are getting when it comes to ebooks. Library-themed journals, blogs, and conferences are filled with talk about digital technology and resources. Yet in this deluge of discussion, there is too little exposing - and opposing - the unfair and unnecessary economics of ebooks for public libraries. Here it is simply. Digital access to a single title - one ebook - costs the public library $85. That $85 is good for only 26 downloads. And only one customer can borrow the ebook at a time. Under this arrangement, publishers have the best of both worlds. For borrowing purposes, the ebook is treated like a single copy of a print book: only one customer can borrow one title at any given time. But for licensing purposes, the ebook is treated as a controlled digital resource that must be licensed and continually renewed. Libraries already pay more than full price for print books. There's no volume discount, or non-profit discount. But in the case of ebooks, libraries pay exorbitant fees, anywhere from eight times to 500 times as much as the general public. A print book is available to a theoretically infinite number of library customers, until it physically falls apart. An $85 ebook is available for 26 downloads. After that, the library has the option of licensing it again - essentially re-buying it - for another $85, good for another 26 customers. This is a blatant ripoff and a terrible use of public funds. Canadian author and blogger Cory Doctorow has been instrumental in trying to focus attention on this issue. While I was in Chicago, I sat down with some of the ALA strategists to talk about how libraries are getting a raw deal on e-books. When libraries want to buy an ebook from the publisher, they find themselves paying as much as five times the price you or I pay for the same book. Literally – librarians are paying $60-80, and sometimes more, to include current release frontlist titles in their collections. Each of these ebooks can only be lent to one patron at a time, which means that libraries are sometimes buying a dozen – or more – of these overpriced text-files. Not only that, but libraries have to buy these books with DRM on them, and invest in expensive, proprietary collection-management software from companies like Overdrive in order to ensure that only one patron at a time can check out any given ebook. These ebooks come with restrictions that don’t appear on regular print books; they can’t be sold on as used books once their circulations drop below a certain threshold; neither can they be shared with another library’s patrons though standard practices like interlibrary loan, a mainstay of libraries for more than a century. To add insult to injury, HarperCollins insists that libraries delete their ebooks after they are circulated 26 times. This has been pitched as having some parallel to the fact that many library books eventually disintegrate and have to be discarded. But this is both wrong and perverse. Wrong because the 26-circulation cutoff bears no relationship to how many times a book can circulate before it falls to bits. It amazes me to think that HarperCollins wants to frame its products as so badly manufactured that they can’t withstand being read 27 or more times. But beyond the factual problems with a 26-circ cap, there is the fundamental perversity of celebrating and importing the limitations of physical media into the digital world. It’s like insisting that electric bulbs be limited to outputting no more than one lumen of light, since that’s all a comparably-sized candle would manage. The fact that books don’t last forever is not a feature to be preserved through the digital transition: it’s a bug, and the sooner we eliminate it, the better. The American Library Association, the parent organization of all North American library associations, formed a group called Authors for Library Ebooks (@Authors4LE on Twitter), which seeks to enlist writers to the cause. Did you know that many ebooks are not available to most libraries at any price? Of those we can buy, libraries frequently pay 150 to 500% more than the consumer price, forcing us to purchase fewer copies for library readers to discover. As more books appear only in electronic form, the situation will become intolerable for our nation’s readers. . . .
Help us raise awareness of this issue with publishers, other authors and the general public. Art Brodsky, in an excellent piece in Wired, explains how the "collusion of large ebook distributors in pricing...contribute[s] to the ever-growing divide between the literary haves and have-nots." How do such restrictions reinforce the divide between haves and have-nots? Imagine walking into a library or bookstore and needing three or four pairs of different glasses to read different books manufactured to specific viewing equipment. Or buying a book and then having to arbitrarily destroy it after say, two weeks. That’s just nuts. But it’s the current situation we’re in with ebooks. . . . Sadly, pricing changes the game for library access altogether because ebook distributors have radically changed the pricing from that of regular books. These authors don’t mind the high prices charged to libraries because they don’t even like libraries to begin with. Stewart has called libraries “undeniably socialist” because books can be loaned out (for free!) many times, costing writers money from presumably lost sales. This is the same justification book publishers use for their distorted ebook pricing. But that’s just wrong. Most physical books in libraries aren’t tattered and worn out, particularly hardbacks. And just because an ebook may last forever doesn’t mean it will be read. Reader demand changes with the cultural context: When The Help was at the top of the Times’ fiction best-seller list for 15 weeks in 2011, readers had to wait weeks for copies to come back to their libraries; but now, 39 out of the 79 copies of the book in my local library system are available for checkout. Once I learned how ebooks were gobbling up library budgets, I wished the library world had turned its collective back on ebooks altogether. I would rather see the entire ebooks budget spent on print resources, or even on DVDs and videogames. That would certainly bring more resources to more people, which is part of our mission. But that ship has sailed. Libraries cannot afford to be perceived as antiquated or anti-technology, and library customers deserve access to all available formats. The problem is not ebooks: it's publishers and distributors - and overly restrictive digital-rights management. Way back when, when wmtc featured "we like lists" posts, there was a post called "it was the best of lists, it was the worst of lists". We identified both the good and the bad in the same thing. One of those lists, courtesy of M@, was about ebooks. 1. They tend to be cheaper. 2. There's an opportunity, currently being somewhat fulfilled but possibly to improve, for authors to be better compensated for their work. 3. The democratization of publishing is possible in the way that the democratization of music happened in the last 10 years or so. 4. They really are very convenient to buy and read. 5. Every book can be available to every internet-connected person on earth. 1. I like the tangible properties of books. 2. I love browsing bookshelves, both in stores and in people's homes. Browsing virtual bookshelves doesn't even compare. 3. Book prices have not stabilized. Currently many e-books cost more than their trade paperback equivalents, not less. There is no good reason for this. 4. I find flipping through reference books a great way to find things I didn't know I wanted to learn; I find flipping through any book a good way to get a sense of whether it's worth reading or not. There is no equivalent in an e-book. 5. I can't figure out how to sign electronic copies of my books. I agree with everything on this list, although I have grave concerns about a democratization movement that depends on access to and comfort with technology, since those are not democratically distributed. But for me personally, I wouldn't care if I never read another ebook again. The only advantage I find is the ease of carrying them around: they lighten the load on my shoulder or in my backpack. Other than that, I agree with the more than 60% of young readers surveyed in the UK: I prefer print books. I get 100% of my news and other reading online - no broadcast or cable TV, no print newspapers, no print magazines. But when it comes to books, I prefer print. And when it comes to libraries, I prefer our budgets not be held hostage to profit-driven digital-rights-management schemes. Meet the new permanent youth librarian at the Mississauga Central Library. I've been in this position since January, but on a temporary or contract basis. Two big things had to happen in order for this job to post as permanent, and they were completely out of my control: two other people also had to get permanent promotions. If either of those people didn't get their permanent positions, my contract would have ended. I would have gone back to being a part-time library assistant (which would have been a huge hit both financially and in terms of responsibility) and tried for another contract librarian position. In the last few months, both those people came through with their promotions. When I congratulated them, it was also - mostly? - happiness for myself! Finally, a few weeks ago, my position posted as permanent. "Full-time permanent," in this context, means being eligible for benefits: paid vacation, paid sick time, extended health, pension, and so on. It also means the security of knowing I won't work as a library assistant in our system again. Only one-third of staff in our library system is full-time permanent, and that percentage is shrinking all the time. So whenever a full-time, permanent job posts, there's a lot of competition. I interviewed last week, and I got it. This is the final piece in my Big Life Change that began with applying for graduate school in 2009. I'm sure I'll have other librarian jobs as my career progresses, to keep things interesting. But in terms of the career and life transition: this is it. I grew this! It's eight inches long, and three more are on the way. What's ordinary to you veteran gardeners is still miraculous to me. Gardening on a small scale is easy, fun, and very rewarding. Reading a news story about Robin Williams' death, I saw a tweet from Jimmy Kimmel. It said, in part: "If you're sad, tell someone." Depression is "you're sad" the way cancer is a pimple. And telling someone doesn't make it go away. For severe depression telling someone is... well, it's nothing. I'm assuming Kimmel meant, if you're depressed, seek help. Yes. Good advice. But Robin Williams did seek help. He was in treatment. So was David Foster Wallace when he killed himself. So was... I could go on. Severe depression is often untreatable. That's the terrible truth. Today I'm thinking of a friend I've lost to mental illness. And I'm thinking of everyone I love who lives with the absence that suicide leaves behind. I'm thinking of my friends who struggle with depression but are winning their battles. Please keep fighting. Still, I knew there was more I could do, if only from my computer. I recently took a step that will add a bit more relevancy to my life, something that seems fairly easy to do and can have an impact: I've joined Amnesty International's Urgent Action Network. You may remember - or perhaps you've participated in - Write For Rights, a big Amnesty International letter-writing push that coincides with International Human Rights Day. I've participated in WfR a few times, and this year was contacted by someone from Amnesty Canada's Urgent Action Network, inviting me to join. I had just started my full-time job and was feeling overwhelmed with change, so I expressed interest but asked if she could contact me again later on in the year. She's obviously got her act together, because she did. And this past week, I joined. The Urgent Action network is made up of 165,000 volunteers in 55 countries. You receive information on a case, and are supposed to respond within 24 hours (or as soon as possible). You can receive one case per month, or one case every-other month. Amnesty supplies writing guidelines, information about the case, and a sample letter from another past case. You write and send your own letter, based on the information you receive. Letters are supposed to be polite, short, and factual. If you're comfortable writing letters, it's not all that time-consuming. I see no reason why I can't crank out one decent letter each month. I told the contact person if I find I can't keep up, I'll cut back to every-other month. Amnesty offers a lot of support and is very sensitive to the demands on all our lives; if you need a month off, or want to write less frequently, you just say so. I'm trusting the good people at Amnesty to use strategies that work. One thing's for sure: we know that evil thrives in darkness. A few hundred letters can show that the world is watching. * My first two years of grad school, I always scheduled classes on meeting days, and the University of Toronto is conveniently located for meetings at the Steelworkers Hall. But in those days I had "only" (ha!) school plus one job. Once my library job came through, something had to go, and unfortunately that meant WRSC meetings. I would come back in the summer and during my school breaks. Then once I started working more, I had to cut that out, too. Dislike! "The Pink House", the last abortion clinic in Mississippi. The owner painted it pink so it would stand out, in defiance. I've thought a lot about heroes, that tremendously overused word, about who my heroes are and why I love them. Moral courage, as you may know, is my highest value. Now, reading this story in Esquire about Dr. Willie Parker, the last abortion doctor in the state of Mississippi, I realize there's another ingredient shared by all my heroes: an abundance of compassion. Dr. Parker, a committed Christian, embodies both physical and moral courage, refusing to run despite the knowledge that others who tread this path have been murdered. Dr. Parker fills a vital health and social need by performing abortions in Mississippi. But he does more than that. He offers compassion (along with education) to every patient. Dr. Parker not only wants women to decide for themselves whether and when to bear children. He wants to help free them of the guilt and shame that they've internalized from the surrounding anti-abortion culture. He is very smart, politically; he understands what really drives the anti-abortion movement. One result: In 2012, America's teenage girls had an average of thirty-one births per one thousand. In Canada, the number was fourteen. In France, six. In Sweden, seven. The difference is that those countries promote contraception without shame. "So it seems like if they want to reduce abortion, the best thing to do would be to support contraception—but they're against contraception, too, because contraception and abortion decouple sexuality from procreation. That's why I think religious preoccupation with abortion is largely about controlling the sexuality of women." This is a tremendous article, which Esquire released online in advance of the print edition, because of the recent court ruling blocking a Mississippi anti-abortion law. I hope you will read it in its entirety: The Abortion Ministry of Dr. Willie Parker, by John H. Richardson. I have been avoiding the photos I took on my trip with my mom in May. I suspected they were going to be pretty crappy and I didn't want to see them. But finally I did go through them, got rid of the worst offenses, and posted the rest on Flickr for safekeeping. I'm not happy with them, but... oh well. If you're curious: they are here. There are some nice photos of my mom, and I'm even allowing a few of me to stay up, as intensely camera-shy as I am. babe ruth was not a fat red sox: thoughts on historical fiction arising from dennis lehane's "the given day"
I recently read The Given Day, Dennis Lehane's novel about 1919 Boston, especially the Boston police strike, and the widescale rioting that followed. The book is an engaging hybrid of historical fiction and noir crime thriller. It deals with labour history, racial bigotry in both Jim Crow states and Boston, radical political organizing, and the United States during World War I and on the eve of Prohibition. It's also full of great characters, plot twists, and suspense. If you enjoy historical fiction, I do recommend this book. However, I'm writing about it to highlight something that bothered me, and to try to analyze why. I edited 1918, so I happen to know a lot about baseball in 1918, and especially about the young Babe Ruth, in his pre-Yankees days. That's why, when I began The Given Day, I was startled to read Babe Ruth described as fat. In the time that The Given Day is set, the overweight Babe Ruth is years in the future. I was so troubled by this error, that I almost put down the book. But I continued reading, and ended up enjoying it. Then, at the end of the novel, Lehane makes another error, again related to Babe Ruth, this one an often-repeated mistake: he writes that Ruth was traded to the Yankees. Red Sox owner Harry Frazee didn't trade Ruth to the New York Yankees. He sold his contract. In a trade, Ruth would have gone to the Yankees and Yankees players would have gone to the Red Sox. But Babe Ruth went to the Yankees in exchange for $125,000. That's not a trade. It's a sale. Again, I was so disappointed to see this. Why do these minor details bother me so much? In historical fiction, fictional characters come into contact with actual historical events, crossing paths with people who really lived. Through the fictional characters, the reader gets the ground-level view, the emotions, the human factor. And through the historical events, the reader gets the larger picture, the context, the backdrop. When we read historical fiction, we expect certain indisputable facts to be portrayed accurately. How the Red Sox fared in 1918 and when the Volstead Act (Prohibition) took effect, for example, are indisputable facts. Even in fiction, those should be accurate. Indeed, the conventions of historical fiction demand that they are. Similarly, we rely on the fictional portions of a historical novel to be plausible. In The Given Day, when the fictional character of Luther Lawrence, an African-American man, interacts with a white gas station owner in Oklahoma and with a corrupt member of the all-white Boston Police Department, those interactions must reflect the attitudes and conventions of 1919. As readers, we rely on the author's research and retelling of historical events to be accurate, and we rely on the fictional portions of the book to be plausible relative to the time setting. We shouldn't see characters turning on the TV (or the radio) to get the latest Red Sox scores. We shouldn't see African-Americans hanging out in Boston Irish saloons. And we shouldn't see a fat Babe Ruth. When I read Babe Ruth in 1918 described as fat, I thought, if Lehane has gotten this wrong, what else has he gotten wrong? Can I rely on the history in this historical fiction to be accurate? I wanted to give the author the benefit of the doubt. Was there a reason he would describe Ruth as overweight? While Lehane was researching, he must have looked at photos of all his historical characters. 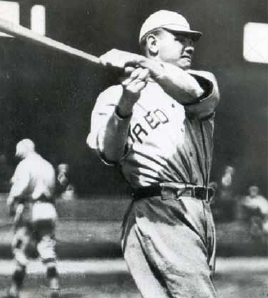 It would have been easy to see that Babe Ruth, in 1918, was not fat. So was this a plot element, perhaps, or a device? As far as I could tell, it was merely description. That made me wonder why Lehane wouldn't purposely describe Babe's powerful, trim physique, since that may very well be different from what the reader expects, and could add a touch of interest. Other than The Given Day, I have no knowledge of the Boston police strike or the riots. I have no independent knowledge against which to truth-test the events recounted in Lehane's novel. Like most readers, I'm counting on Lehane to present the facts. I believe it's his obligation to do so, and what's more, I believe that Lehane sees it as his obligation, too. In the portion of the book with 1918 Ruth, all the other details are accurate, a heap of little facts gleaned from historical accounts: Ruth punching hats on the train, Ruth having left the team to play in Chester, Pennsylvania, his expensive gift from Harry Frazee, and so on. Why weave together all these actual events, but describe Ruth the way he looked 20 years later? Everyone makes mistakes, for sure. It's not that I think Lehane made some kind of unforgivable breach or that this error ruins his very fine book. But once I saw that error, it was difficult to trust the rest. I found a bunch of recipes similar to this, and adapted them to my tastes. This one is easy (especially if you use a food processor to shred the zucchini and cheese), healthy, and tasty. I feel like the ability to tweak and change recipes marks a turning point in my cooking evolution, in both confidence and knowledge. I like it! Also, I don't have measurements for this one. It's down to what proportions you like and what ingredients you have on hand. In a baking dish, combine zucchini, tomatoes, corn kernels, basil, salt, and pepper. Stir until all are thoroughly mixed. Mix Parmesan cheese and bread crumbs, then sprinkle the mixture on top. Bake in 400F/200C oven for 45 minutes. how a reinvented dutch library set new attendance records and why is this still controversial? This article about the incredible Nieuwe Bibliotheek (New Library) in the Netherlands got me thinking about the current state of libraries - and library staff and library customers - and people's attitudes towards change. The library is also a Seats2meet (S2M) location where patrons are empowered to help one another in exchange for free, permanent, coworking space, and they utilize the S2M Serendipity Machine to connect library users in real-time. They also have a bustling cafe, an extensive events and music program, a gaming facility, a reading garden and more. The result? The New Library surpassed all expectation about usage with over 100,000 visitors in the first two months. It is now considered one of the most innovative libraries in the world. Check out the article, and the photos of the community enjoying Nieuwe Bibliotheek's eye-popping spaces. Now imagine: there are library staff and customers who dislike and oppose this. It's not necessarily a generational divide, either. Many older librarians have embraced the new library ethos while some younger librarians gaze fondly back at some imagined golden age. Although the library in which I work can only dream of the kind of innovation achieved by Nieuwe Bibliotheek, there are staff who complain about any step towards it. Generous book display tables, clear signage based on topic (as opposed to Dewey), innovative programs - they hate it all. Fortunately, those people are not in decision-making positions, and innovation moves ahead despite their grumbling. But the more I try to understand the reasoning of old-school librarians, the more I think they either don't understand the pressures facing libraries today, or they simply oppose change. Once upon a time - that is, for most of the modern era - public libraries were repositories of information that couldn't be found anywhere else. Most ordinary people did not have access to reference tools, and needed the library for all manner of research and learning. When I was a child, we would call the New York Public Library helpline with questions we couldn't find in our family's set of encyclopedias. Now, of course, we would simply go online for the answer. We've undergone a revolution in information access. To many people, this digital revolution makes the public library irrelevant. Of course, library supporters know this is not true. First of all, not everyone can afford the tools of home-based internet access, and public libraries are the only bulwark against that yawning chasm known as "the digital divide". Beyond that, there's quality and depth of research, something at least students still need. And there's reading. I'm giving that its own line. Avid readers and families who understand the critical importance of reading cannot possibly purchase all the books they need! Yet the mere existence of a quick way to find answers to simple questions leads many people to believe libraries are irrelevant. More importantly for libraries, powerful interests that don't value public services and would prefer to see everything for-profit and privatized can use the digital revolution as a convenient smokescreen to slash funding. In the current era, public libraries have reinvented themselves in order to remain relevant to their communities. As often happens, change originally borne out of survival turns out to be a very positive development. My own library is alive with this kind of activity - family storytimes, resume help, language learning, book clubs, movie screenings, you name it. The most recent trend, คาสิโนออนไลน์ แจกเครดิตฟรี 2019makerspaces in libraries, turns the library into a place where people learn new skills and create things, using tools and resources normally unavailable to them. (Did I tell you I'm now on the Maker Mississauga committee? More in a future post.) The library also provides free leisure options. Some people find it quaint and outdated, but thousands of people borrow CDs, DVDs, and video games. Not all change is good, of course. Change needs direction and purpose. It needs to add value for customers and make economic sense for the investment of public funds. But change is life. In the case of the public library, it's change or die. Healthy innovation is the only alternative. guest post: "rob ford, eid prayer and the silencing of dissent"
My Eid started out like most, enjoying a morning coffee after a month of abstinence, rushing to get to the downtown prayers at the Metro Toronto Convention Centre and navigating through hoards of playful children and beautifully dressed congregants. The khutbah was moving and poignantly addressed the state of our Ummah. Even as we celebrated the end of a blessed month, our hearts were heavy and our thoughts consumed by the horrors unfolding in Gaza, Syria, Egypt, Iraq, Afghanistan, Pakistan, Burma . . . it seemed like an endless list of places. The Imam spoke proudly of the Arab Spring, a pride all Muslims shared. He spoke of the courage, fortitude and resilience of people who overthrew decades of tyranny for a chance at democracy and despite the unfathomable violence they suffered, the multiple prison terms they endured, the daily fear they confronted, they fought on. After prayer, the festivities began. Families gathered around shared meals and children enjoyed carnival rides and activities - my son's favourite was the "Birds of Paradise" presentation. Approximately two hours into the festival my 13 yr old daughter and I spotted Rob Ford and his entourage making their way up the escalator. I was both surprised and disgusted to see him there, but was confident that he would simply be ignored and his appearance would be brief and uneventful. We continued browsing the maze of vendor booths and as we made our way back around I was aghast to see the swarm of people that had gathered around Ford! Taking selfies with him, shaking his hand, greeting him like some sort of celebrated hero and Ford was clearly revelling in it all. What was happening? What exactly was I witnessing here? Were people really not aware of Ford's racist belittling of immigrants? Did they not see how Ford's drug use spurred a police raid on the Somali community, while he and his privilege walked away free and clear? What about his relentless lying, persistent bullying (I could post several links here), his lewd comments directed at other councillors? What about his support for Israeli apartheid? Was this really someone people wanted to shake hands with, be photographed with, share an Eid selfie with??? At first my daughter and I just stood around watching the side-show in disbelief. Then we noticed a man weaving through the crowd shouting "Rob Ford's the best!" Like us, he had a darker complexion and could easily be mistaken for one of the congregants attending the festivities. He continued to yell, "Rob Ford, Rob Ford, Rob Ford!" urging the people around him (mostly boys and young men) to join his chant and it became apparent that he was part of Ford's campaign. What's worse was that there were various media crews filming the entire spectacle. Rob Ford had managed to co-opt our event, use minorities as his doting props and the footage would show the Muslim community seemingly cheering for this man. My spontaneous reaction was to try to counter the chants, I booed, I yelled "Go Home!" Nothing terribly articulate or witty, but nothing remotely profane either. I was immediately confronted by a couple of men and a woman who said I was being rude and that "he was a human being too," and I was obliged to be nice to him on Eid. Really? Was I obliged to let a loathsome man and his manipulative campaign team spin our special day into an apparent pro-Ford rally? Did we not just listen to an entire khutbah about justice and solidarity and standing up to tyrants? Not only had white, male privilege helped Ford evade any responsibility for his reprehensible actions as Mayor, but now I was expected to uphold that system of privilege by members of my own community, to be the model minority, to not make this man feel uncomfortable or unwelcome. My attempt at yelling was getting nowhere, I wasn't loud enough and frankly yelling just isn't my style, so we left, but the circus continued. I searched for the rest of my family (my husband was at the carnival rides with our youngest) who were completely unaware of Ford's presence. After relating the incident, my older daughter suggested I quietly hold up a sign in protest and her friend suggested a slogan. My goal was to hold the sign behind Ford so it could potentially be captured in all the selfies. It was an attempt to do something; even something minor to interrupt what I feared would become an evening news segment about how Muslims celebrating Eid were expressing their support for Ford. My sign read, "Go Home! We can't a-Ford you!" Again, pretty benign as far as protest signs go. As I made my way back to the crowd and tried to position myself directly behind Ford, it wasn't long before a man, who I'm assuming was an Eid event organizer took the sign right out of my hand. He said it was his event and I wasn't allowed to hold up that sign. He said I was embarrassing myself and when I assured him that I wasn't the least bit embarrassed and that I was proud to express myself, he said he was embarrassed for me. WATCH VIDEO 1: My sign is taken away. I asked a friend to help me blur out this person's face as it's not my intention to target him. But I did want to include this video because it illustrates what was happening and shows the crowd that had gathered around Ford. Apparently standing there silently with my sign was more detrimental to our community's reputation than a swarm of rowdy, impressionable youth being incited to chant Ford's name. Apparently it was more necessary to confront me, than to stop the man who was manipulating the crowd. I was silenced, not Ford; I was expected to not make a scene, not Ford; I was treated like I was the problem, not Ford. The bullying didn't end there. Soon after my sign was taken from me, a reporter who had witnessed the incident asked if I would mind speaking with him about why I felt a need to hold up that sign. As we tried to proceed with the interview, the same man who had been urging youth to chant "Rob Ford" began disrupting us. He started shouting at the reporter and then started shouting at me, trying to drown out my voice. At the end of the video you can also see how he was able to get bystanders to also begin shouting at me. Was this not disruptive, offensive, abusive behaviour? Did the organizer not feel a need to intervene when I was accosted by Rob Ford's campaigner? Was my sign more belligerent than this man's behaviour? Of course not! But I'm the easier target. It's easier to shut down a Muslim woman than to deal with Ford's bullies. WATCH VIDEO 2: Rob Ford's campaigner disrupts my interview. He tries to intimidate the reporter then towards the end he begins shouting at me and encourages those around him to join his chant. Post-9/11 and especially in the current Conservative climate, I recognize that Muslim communities and institutions operate under tremendous pressure and are justifiably fearful of 'rocking the boat.' The NSA/FBI's surveillance practices remind us that Islam and Muslims are under constant suspicion, and perpetually countering the Islamophobic narrative is challenging and exhausting. I understand the desire to protect our collective reputation. But silence is not the answer. Quashing dissenting voices will not make us more palatable. As fully engaged and integrated Muslims, voicing criticism is our right, our duty, our strength. It's not an "embarrassment" and it never will be. What's embarrassing is the ignorance, the need to appease and the shameful lack of courage that was demonstrated on Eid. As a Muslim woman of colour, I'm accustomed to being judged for my beliefs, my choice of dress, my political/social views, but I don't expect and won't accept such discriminatory treatment from members of my own community. Sure, Rob Ford's presence kind of ruined my Eid, but bullying and intimidation is his modus operandi - I know that. Being silenced and dismissed by some members of my own community was far more disappointing.